It's almost Farmer's Market season -- we're all signed up for our CSA share and ready to start seeing those greens! Charlotte has a growing local food movement and at its center is the Charlotte Tailgate Farmers Market. In 2007, Colleen Taylor and I worked with Market Manager Lynn Caldwell and founding farmer Sara Fennell to create some branding for the new and growing market, then in its second season. On a tight budget, The Tailgate's marketing efforts were limited to business cards, posters and a few ads in Creative Loafing ... that and some serious grassroots efforts from Caldwell, the farmers, and their customers. Caldwell sent regular emails to neighborhood lists, wrote blog entries, and attended Slow Food events, including a dinner with the legendary Alice Waters (whom was quite impressed with our business cards, I might add!). Since then, The Tailgate has moved to a new, bigger location in Southend and has ditched the radish artwork for a sunflower illustration. Plaza Midwood misses our market but I still make a weekly trek to get my veggies -- just can't do it on foot any longer. We look forward to bounty of the 2009 season. As for the aforementioned Sara Fennell, in 2008 the established urban farmer and native Charlottean moved her family to Galax, VA, to start Groundswell Farm, a FOR REAL-farmy-farm (acres and tractors and all). I was honored to help her with her branding. We needed to reflect Sara's folksy-yet-hip, unpretentious personality and communicate the quality of her product -- a little tricky since farmers aren't allowed to call their organically-grown vegetables "Organic" unless their certified. Working from one of Sara's quick sketches from a brainstorming meeting (my girl could moonlight as an illustrator, right? ), we created a logo that made it clear what her farm was producing and infused some of her personal style. The business card was printed with rounded corners, as was a postcard produced to keep in touch with her Charlotte customers and growing list of Galax patrons. 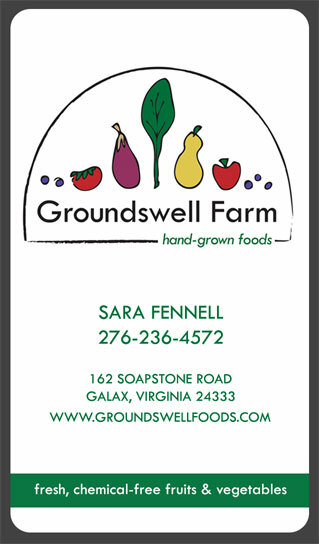 Sara now manages the Galax Farmers Market and Groundswell is going strong.